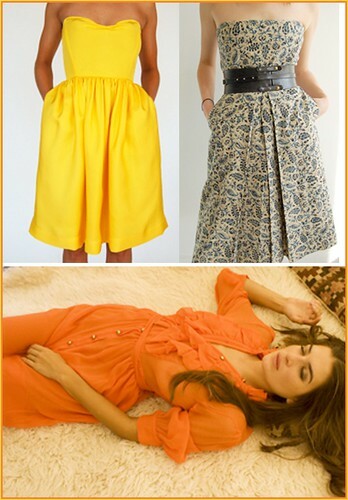 If I could make frivolous purchases, if my closet were larger, if I were not going to don a pregnant belly this summer and fall, I’d buy Heidi Merrick‘s entire collection (sale items are in her shop). I love everything. Yes everything. There is nothing I wouldn’t wear. Her colors are swoon worthy, her fabrics frothy, her silhouettes perfection. Alas, I will just have to covet….for now. I hope you have a splendid weekend. I’m so excited that it’s nice here. I’ve been emailing and chatting with friends and clients in Chicago and San Francisco who tell me it’s cold and rainy where they are. I feel really grateful that Brooklyn is so springy and pretty. Saturday I’m going to paint my little student’s faces at our annual street fair. The weather is supposed to be perfect. Dave and I will walk in Central park afterward and sit under a cherry blossom tree. Then we have to get back to spring cleaning our apt. I also have to finish up some projects. Hope you are doing something relaxing and creative. XO. I checked these out—I love that black & green patterened fabric. So striking! yes, she’s totally amazing. I love her stuff too! oh I know Christina….everything…..everything she does is so glorious! I’m with you on that! I love her clothes! the colors the fabrics….everything is so stunning.